The founder of the Family Li Imperial Cuisine, Beijing, Professor Li Shan-lin, taught Applied Mathematics at the Beijing Capital Economy & Trade University. His wife, Wang Xiao-zhou served as a pediatrician, who passed away in Dec 2009. Professor Li was born to a prestigious Manchurian family, whose ancestors were “Zhang Bai Qi”(Normal White Banner) Manchurians. His grandfather, Li Zhi-jia, who lived in the years from Tongzhi to Guangxu periods during the Qing Dynasty, was a high-ranked official working in the Imperial Court. He was Commander-in-Chief of the Palace Guards responsible for the security of the royal family. He had the duty to ensure that all household affairs in the Imperial Court were safely taken care of by his staff to the highest standard. He was also in charge of organizing all the royal banquets including designing the menu recipes. Being brought up in a family of such a prestigious background, Professor Li has a passion in search of excellence in culinary art since his childhood. The delicacies of the Imperial Court cuisine currently served in his restaurant are the results of such passion and much research during his lifetime. He inherited the family mantle and his wife also enjoyed the art of cooking. His knowledge for culinary art is passed on to his only son, Xiao-lin. While not professionally engaged as a chef in the beginning, Xiao-lin acquired excellent culinary skills. In October 1984, the Li family won the top honor in the National Day Banquet Cooking Competition. Then in 1985, Professor Li decided to establish the Family Li Imperial Cuisine, to offer the gourmet public authentic dishes directly from the Imperial Court as well as other delicate dishes of Beijing. Since its opening, the restaurant has achieved great success. Guests cannot fail to be impressed by the unique style of operation, the cultural atmosphere, and above all the ultimate culinary experience. The restaurant’s endless guest list of celebrities includes famous politicians, leaders of business, scholars, and artists, representing the elite of the society from all over the world. Many of them have come to meet the amiable Professor Li and taste the celebrated dishes from the Family Li. The Family Li’s dishes are, as it is, a combination of Imperial Court cuisine and Beijing traditional cuisine. With careful selection of only the freshest ingredients cooked to perfection in a refined style, the chefs at the Family Li Imperial Cuisine aim to retain the natural and original flavors of the produce. The presentation of dishes is always attractive but never pretentious. In September 2010, Mr Li Xiao Lin, the only son and successor of Professor Li opened a new branch in the Shunyi District of Beijing. Xiao Lin inherited the family mantle and has assisted his parents to manage the old Beijing restaurant since 1985. He was commissioned to open the first overseas branch restaurant in Melbourne, Australia in 1990. In 2003, he was commissioned to open the Tokyo branch in Roppongi Hills. For 3 consecutive years since 2008, the Tokyo restaurant has been awarded 2 stars by the Michelin Gourmet Guide (Tokyo). Xiao Lin opened the Shanghai branch in 2006 and the Tianjin branch in 2008. Located in the picturesque Huang Pu Park, the Shanghai restaurant is appointed as one of the few restaurants to serve foreign dignitaries in the 2010 World Expo. The new branch is located at Europlaza, opposite to the New International Convention Centre. Xiao Lin, who got a First Honour Degree in Interior Design at the Royal Melbourne University of Technology in 1996, is responsible for the design of this new restaurant. Mr. Li Xiaolin, Manchurian, was born in Beijing. Li's father was a mathematics professor in the Capital University of Economics and Business; his mother was a pediatrician. Mr. Li is an interior designer who graduated from the Interior Design Department of Royal Melbourne Institute of Technology University in 1996. He was awarded a First Honor Degree. Born to family with a prestigious history, Li loves calligraphy and painting since he was a small child; and he has always possessed a strong passion in the culture of Chinese Imperial Cuisine. As the youngest and only son in the family, Li Xiaolin helped to found the first Family Li Imperial Cuisine in Beijing in 1985. Attending university during the daytime, he worked as the chief chef in his spare time. 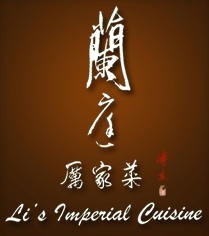 In 1991, Mr. Li assisted to launch the second restaurant of the Family Li Imperial Cuisine in Melbourne, Australia. In 1999, Mr. Li returned to Beijing to participate in the operations of the Family Li Imperial Cuisine. In 2003, Mr. Li helped to found the third Family Li Cuisine in Roppongi, Tokyo, Japan. In the following four years, he spent three to four months per year in Tokyo to provide technical support and was the chief consultant for the Tokyo branch. In 2008, Family Li Imperial Cuisine, Tokyo was awarded two-stars by the famous Michelin Guide (Tokyo). From 2006, Mr. Li has served as Technical Consultant for the Family Li Imperial Cuisine, Shanghai and the Family Li Imperial Cuisine, Tianjin, which was established in 2008. The Shanghai branch is a member of the world famous gourmet guide Ralais & Chateaux. Chef Li was named one of the Grand Chefs in its 2011 guide book. A new restaurant of Family Li Imperial Cuisine is located in the Shunyi District of Beijing, fully owned and run by Mr Li Xiao Lin. It was opened in 2010. The restaurant is designed by the talented chef-designer who strives to further elevate the dining experience of his guests. To Li Xiaolin, the culinary art and interior design are the two very essential areas in which he spent most of his time. He was twice invited by the Mandarin Oriental Hotel, Hong Kong as visiting chef in 1991 and 1996; and was invited by the Raffles Hotel, Singapore in 1993 to do a food promotion. Chef Li was also invited by the world famous Japanese chef, Mr. Nobu for a cooking performance together in Tokyo to celebrate the anniversary of Nobu’s restaurant in 2003. Chef Li was invited by the Ritz Carlton Hong Kong Hotel as guest chef to do a food promotion for 10 days at its Chinese restaurant Tin Lung Heen in July 2012. In June 2013, he was invited by the same hotel to participate in their Second Asia Pacific Food and Wine Festival and was very well-received. Last but not least, Chef Li is named 2014 Diner’s Club Lifetime achievement award winner. His latest developments are the establishment of the Family Li Imperial Cuisine, Taipei, which was opened in July 2014 and is located at the Bellavita, a prime location in Taipei. In Dec in the same year, the first Family Li Imperial Cuisine in Europe opened its door to gourmets in Paris, located in the bustling district at 75008. During the summer of 2015, Chef Li was invited to do promotions at the Jockey Club in Hong Kong, the Jade Dragon restaurant in Macau and the J.W. Marriot Hotel in Seoul and was very well received. The Family Li Imperial Cuisine is open daily for lunch and for dinner. 厉家菜主人厉善麟, 北京首都经贸大学数学教授; 夫人王晓舟, 儿科主任医师, 祖籍北京, 满族, 正白旗; 祖父厉子嘉, 清朝同治,光绪年间内务府大臣, 总管大内衣, 食, 住, 行, 宫廷大宴总掌提调. 厉教授受家庭影响自幼酷爱烹调技艺, 对宫廷饮食研究有素, 王府珍馐情有独钟, 常与夫人双双下厨, 亲自操作, 并将所得真缔传于唯一儿子厉晓麟. 晓麟虽非专业厨师, 但掌握烹调绝技. 1984年10月,在国庆宴会邀请赛中, 厉家人荣获冠军称号, 由此厉教授决定于1985年在北京开办了专营宫廷风味和北京风味的厉家菜. 厉家菜自开创以来以其独特的经营方式, 绝妙的烹调技艺, 深厚的文化内涵赢得了海内外宾客的好评. 举凡世界各国的高官, 巨贾, 学士, 名流均以一尝厉家菜为快事. 厉家菜融合宫廷, 北京, 府邸菜于一体, 選料精湛, 做工细腻, 配料严谨, 本味原汁, 天然纯朴, 不尚虚浮. 厉家菜传人厉晓麟先生于2010年9月开设新店, 起名蘭庭厉家菜, 以纪念于2009年12月去世的慈母.晓麟自1985年厉家菜开业以来, 一直协助父母管理餐馆, 晓麟于1990年获邀远赴澳大利亚墨尔本开设厉家菜首家海外分店, 于2003年获邀前往日本开设另一家厉家菜分店, 东京厉家菜坐落于繁荣的六本木山, 该餐厅更自2008年起, 连续三年被著名的法国米其林美食指南评为两星餐馆. 除了拓展海外市场, 晓麟先后于2006年与2008年在上海市与天津市开设分店, 坐落于黄浦公园的上海厉家菜餐馆更于2010世界博览会期间, 被指定为专门接待外国元首的餐馆之一. 蘭庭厉家菜坐落于欧陆广场, 紧邻新国际展览中心, 交通便利. 餐厅的室内装饰设计完全由厉晓麟亲自操刀, 揉合古典与现代风格, 务求让宾客倍感宾至如归. 厉晓麟作为厉家的唯一儿子，于1985年协助创办了北京厉家菜餐馆,白天还在上大学, 业余时间兼做厨师。1991年远赴澳大利亚协助创办墨尔本厉家菜餐馆.1999年回国参与经营北京厉家菜餐馆。2003年协助设计并创立了日本东京六本木厉家菜餐馆并任技术顾问，在随后的四年里每年驻日本三至四个月进行技术指导。值得欣慰的是东京厉家菜餐馆于2008年获法国美食指南(东京指南)米其林两星的殊荣.由2006年至今任上海厉家菜的技术顾问。上海厉家菜餐馆为著名精品酒店餐馆协会罗兰夏朵的成员, 厉晓麟并于2011年获该指南的新晋大厨称号. 2008年建立了天津厉家菜并任技术顾问。于2010年底, 厉晓麟再于北京市顺义区自主经营并开设厉家菜在北京的最新餐厅: 兰庭厉家菜, 务求在菜品和就餐环境上都有所提升. 主修设计热爱中华宫廷美食文化的厉晓麟多年来设计、烹饪二者难分主次。其间于1991年和1996年两度应香港文华东方酒店之邀作烹饪表演，于1993年赴新加坡来福士酒店表演。并有幸于2003年应日本名厨Nobu先生之邀在其东京店店庆期间与其合作做烹饪表演。于2012年7月获香港丽斯嘉尔顿酒店邀请于其天龙轩中餐馆献艺,于2013年6月再获该酒店邀请参加第二届亚太区美食美酒节,深受食客欢迎.2014年厉晓麟更荣获亚洲50最佳餐厅颁发The Diners Club终生成就奖. 他的最新发展是于2014年7月在台北开设了台北厉家菜.该店位于台北市最华贵的宝丽广场三楼.而第一家位于欧洲的厉家菜巴黎店也于同年的12月份在巴黎繁荣的第八区开始营业.2015年夏天, 厉晓麟分别受邀前往香港赛马会会所, 澳门譽珑轩餐馆和首尔万豪饭店进行美食推广活动并大受欢迎.